Innovation has never been at its highest. According to the Technology and Innovation Report of 2018 the UNCTAG (United Nations Conference of Trade and Development “We live at a time of technological change that is unprecedented in its pace, scope and depth of impact.” and “change is becoming exponential thanks to the power of digital platforms and innovative combinations of different technologies that become possible every day”. Meaning that even the oldest of organisations are turning into Tech companies. With this comes a huge upturn in demand for Tech skills. In this article we will take a look at which Tech skills are are pushing ahead in the current technology industry. Data breaches can be extremely costly for the company to recover from, it is critical that companies understand the urgency involved with rectifying such a breach. The importance of an organisation having its network security fully optimised therefore means this is one of the most essential jobs in the tech industry. On the other hand, there is an extreme shortage of people qualified to do this job so there is a gap that needs to be filled in the market. With the continued emergence of IoT (Internet of Things), further breaches can be exploited. The role of a Cyber Security Specialist has never been so pertinent. Permanent salaries range from £48,000 – £110,000 pa, depending upon experience. Contract rates vary from £400-£700 per day. Machine learning is definitely regarded as a futuristic technology at the moment. With the growth of chatbots such as Alexa and Siri to self driving cars; the rapid developments in this industry prove it is not one to be pushed aside. Those only just thinking about learning it now would still be coming into it relatively early, companies are predicting that machine learning will become one of their top data initiatives going forward. Therefore, demand for candidates in this area will only grow. One of the main benefits from this technology is that it can be applied to any industry; including finance, manufacturing, education and more. Python being a common programming language in this space means demand for this skill alone is incredibly high. Permanent salaries range from £55,000 – £85,000 pa, depending upon experience. Contract rates vary from £400-£600 per day. As companies move away from siloed back-end and front-end development teams, the demand for full stack developers is on the increase, meaning organisations now wish to hire developers who can work on all levels of the application stack. Permanent salaries range from £45,000 – £75,000 pa, depending upon experience. Contract rates vary from £400-£600 per day. Companies are continuing to increase and see value their own proprietary data, but also investigating ways to incorporate third-party data to solve problems impacting their business, and having internal data science expertise enables them to do that. Advanced analytics and big data initiatives have been launched by over ⅘ companies. Data science and analytics are both based off of big data with analysis being the more entry level skill and data science is far more advanced; however both are extremely sought after and popular. Permanent salaries range from £50,000 – £120,000 pa, depending upon experience. Contract rates vary from £400-£900 per day. It is essential for companies that want to stay relevant in this day and age, to ensure they don’t just have a website but that they have apps as well. These apps need to be fully optimised in order to work well on each different smartphone available. There are many well qualified candidates in this area who excel in app development and can give your business a boost. Another attractive element to mobile development is the vast number of different areas it can be adopted in; for example the Internet of Things, VR/AR and wearable technologies. Permanent salaries range from £35,000 – £80,000 pa, depending upon experience. Contract rates vary from £300-£600 per day. By placing data in a visual context such as graphs and charts, it can make it far easier for it to be understood by those who are not data minded, as many are not. Business Intelligence and Management Reporting has moved on considerably in the last 5 years, with core Technologies supporting this such as; Power BI, Tableau, Qlickview, Sisense, Fusion Charts and Carto. Skills from data modellers through to BI Developers are in demand right now. Permanent salaries range from £35,000 – £75,000 pa, depending upon experience. Contract rates vary from £400-£650 per day. These may be quite closely related however they are in fact different, UI is the development of interfaces for apps and websites so that they are visually appealing and flow well, they do look at how easy it will be for users to navigate but not to the same extent that UX designers would. UX designers spend a lot more time extensively researching every aspect of what they have made, in order to anticipate and consider how each individual user will interact with what they have made. This is then coordinated back to the UI developers to be able to cohesively make the best interface possible. Permanent salaries range from £30,000 – £75,000 pa, depending upon experience. Contract rates vary from £300-£600 per day. These roles are growing because of the popularity of switching from classic server based infrastructure to cloud. One of these cloud platforms is Amazon Web Services, this is currently the biggest cloud platform; many AWS specialists are engineers, cloud architects or system administrators. There simply is not enough resources in the market to cover the current demand. Therefore, rates and salaries are elevated. Other Cloud products causing demand – Microsoft Azure, Google Cloud Platform, Adobe, VMware, IBM Cloud, Rackspace, Red Hat, Salesforce, Oracle Cloud, SAP Hana. Permanent salaries range from £50,000 – £120,000 pa, depending upon experience. Contract rates vary from £500-£1000 per day. 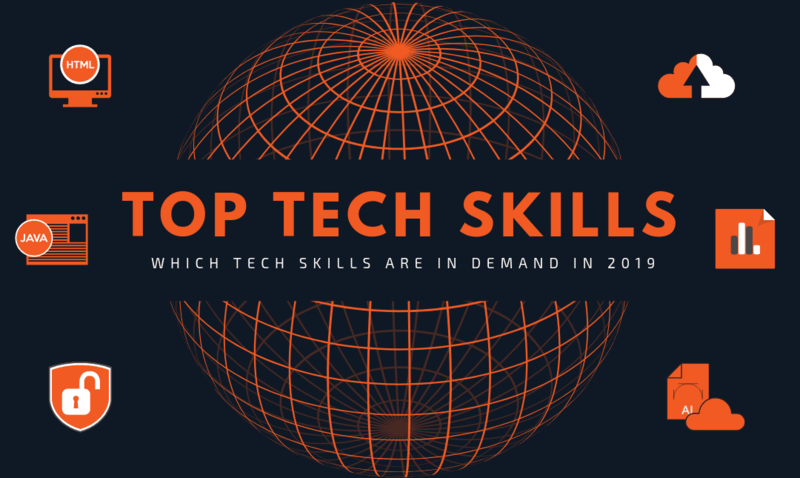 Which Tech skills are “up and coming”? RPA (Robotic Process Automation) is one of the fastest growing Tech sectors. It is software that allows creation of virtual employees or “Bots” to transact in the same way a human would, to perform complex, rule based activities. Repeatable tasks that search, collate, update, access multiple systems and make simple decision are the best RPA targets. The tools operates applications like people do, including logging in/out, clicking on buttons and choosing drop downs. The returns on investment are quickly achieved and very tangible, making this a rapidly growing sector with vendors such as UI Path, Automation Anywhere and Blue Prism. At Vertex we apply our 19 years experience and passion for Technology in sourcing the best candidates for your roles and have an extensive database of IT professionals. We supply Contract and Permanent resources across the UK and Europe. Should you wish to discuss how we can support you please email us!